It is hard to believe but 2016 is half way over! The good news is that at the end of each month, I get to report out our dividend income results. This past month did not disappoint and we are well on our way to having a record year. Reporting these numbers each month helps give a nice recap of where we are in building this sustainable income stream. They also provide an opportunity to show where we were just 5 short years ago in our journey. I know that reporting our dividend income helps keep us motivated to stay on track and hopefully they do the same for our readers. 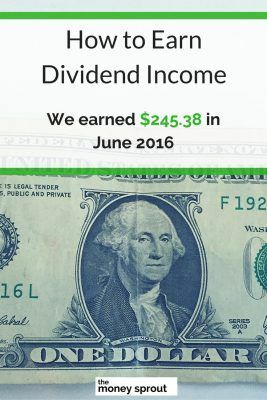 June dividend income was our highest month ever! I still get excited every time we break a new record – which is usually every 3rd month. This is because of the quarterly dividend payout cycle, which is higher for us at the end of March, June, September, and December. We expect to break new records later this year in September and then again in December. This past month, we almost broke the $250 threshold for dividend income in a month and will surely surpass that mark in September. It is hard to believe that just a few short years ago (2011), we didn’t even bring in $250 in dividends in an entire year ($243.81). Just look now less than 5 years later how much we have grown. We saw an increase of over 34.5% last month compared to June 2015! A lot of this increase can be attributed to new money being invested in the market over the last year. We plan to see similar gains as we continue to report our dividend income throughout the year. We continued to invest part of our tax return from this year as well as several other automated investments. 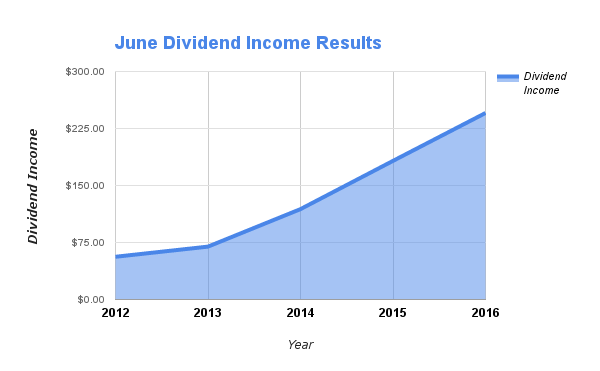 The dividend income earned in June ($245.38) was up over 34% from the same time last year. It was also our highest dividend total ever for a single month! Our goal for 2016 is to earn $2,250 in dividend income. To date, we have earned $910.60 in dividends for the year. At this point, we are on pace to earn a little over $1,820 in dividends for the year. That is certainly above last years totals ($1,475) – but well below our goal for this year. We got some work to do! 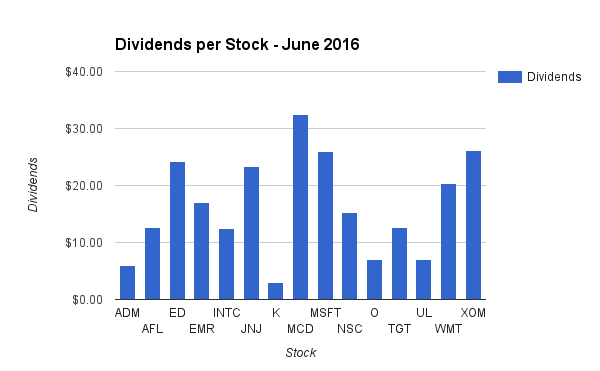 How was your dividend income in June? Full Disclosure – At the time of this writing, we owned shares in the following stocks noted in this post – ADM, AFL, ED, EMR, INTC, JNJ, K, MCD, MSFT, NCS, O, TGT, UL, VZ, WMT, and XOM. The material above is not a recommendation to buy. Please do your own research on a company before deciding to invest.